Stanley Yelnats was given a choice. The judge said, "You may go to jail, or you may go to Camp Green Lake." Stanley was from a poor family. He had never been to camp before. And so, Stanley Yelnats seems set to serve an easy sentence, which is only fair because he is as innocent as you or me. But Stanley is not going where he thinks he is. Camp Green Lake is like no other camp anywhere. It is a bizarre, almost otherworldly place that has no lake and nothing that is green. Nor is it a camp, at least not the kind of camp kids look forward to in the summertime. It is a place that once held "the largest lake in Texas," but today it is only a scorching desert wasteland, dotted with countless holes dug by the boys who live at the camp. The trouble started when Stanley was accused of stealing a pair of shoes donated by basketball great Clyde "Sweetfeet" Livingston to a celebrity auction. In court, the judge doesn't believe Stanley's claim that the shoes fell from the sky onto his head. And yet, that's exactly what happened. Oddly, though, Stanley doesn't blame the judge for falsely convicting him. Instead, he blames the whole misadventure on his "no-good-dirty-rotten-pig-stealing-great-great-grandfather." Thanks to this benighted distant relative, the Yelnats family had been cursed for generations. For Stanley, his current troubles are just a natural part of being a Yelnats. At Camp Green Lake, the warden makes the boys "build character" by spending all day, every day, digging holes: five feet wide and five feet deep. It doesn't take long for Stanley to realize there's more than character improvement going on at Camp Green Lake. The boys are digging holes because the treacherous warden is searching for something, and before long Stanley begins his own search—for the truth. Fate conspires to resolve it all—the family curse, the mystery of the holes, the drought that destroyed Green Lake, and also, the legend of Kissing Kate Barlow, an infamous outlaw of the Wild West. The great wheel of justice has ground slowly for generations, but now it is about to reveal its verdict. Want to spend some more quaity time at Camp Greenlake? "If you're reading this book, chances are you've been convicted of a crime and have been sentenced to the Camp Green Lake Juvenile Correctional Facility.... Maybe you're innocent—more likely not," Stanley Yelnats states in the voice his followers have come to love. Should you ever find yourself at Camp Green Lake—or somewhere similar—this is the guide for you. Stanley (Caveman, to some of you) offers anecdotes and advice on everything from digging the perfect hole to identifying and avoiding the wildlife (scorpions, tarantulas, rattlesnakes, yellow-spotted lizards, Mr. Sir) to help make your stay a more pleasant one. Holes seems to be as much about a place as about the characters. Is that your feeling? Yes. While every other story I'd written had begun with the characters, to me this story has always been about a place—Camp Green Lake. The story began with the place, and the characters and plot grew out of it. Of course, Camp Green Lake has no lake and hardly anything is green. There once was a very large lake here, the largest lake in Texas. That was over a hundred years ago. Now it is just a dry, flat wasteland. There used to be a town of Greenlake as well. The town also shriveled and dried up. During the summer, the daytime temperature hovers around 95 degrees in the shade, if you can find any shade. There's not much shade in a big, dry lake. The only trees are two old oaks on the Eastern edge of the lake. A hammock is stretched between the two trees, and a log cabin stands behind that. The kids are forbidden to lie in the hammock. It belongs to the warden. The warden owns the shade. When you first start reading the book, however, you don't know it's that kind of camp. You just know that you're going to Camp Greenlake. Where did you get the idea for Holes? No, I didn't live next door to a juvenile correction facility. Actually, I never start with a full idea of what I'm going to write. I usually just start with a piece of a character and then see what develops. In this case, I didn't start with a character; I started writing about Camp Greenlake and it developed from there. I suppose the initial inspiration for writing about the camp came from the heat of summers in Texas. At the time I began the book, we had just returned from the relative coolness of a vacation in Maine to the Texas summer. Anybody who has ever tried to do yard work in Texas in July can easily imagine Hell to be a place where you are required to dig a hole five feet deep and five feet across day after day under the brutal Texas sun. How long did it take you to write Holes? A year and a half. A book like Marvin Redpost: Is He a Girl? is simply written and relatively short, taking four to six months to finish. In contrast, Holes took a year and a half to complete. I went through five rewrites before sending it to my editor. It occurs to me now that Stanley was sentenced to Camp Green Lake for eighteen months, which was exactly how long it took me to write Holes. I arbitrarily chose the length of his sentence early on. Maybe on some unconscious level, I knew how long it would take. Did you find the characters taking on a life of their own as you were writing? It happens every once in a while when you're writing that certain characters seem to leap off the page and take over the book, and that's what happened with the story of Kate and Sam. I had expected to make Kissin' Kate a complete villain, but when I started writing about her I ended up making her someone else entirely; it surprised me. Why do you think book's lead character, Stanley Yelnats, connects with so many children? Stanley isn't a hero-type. He's a kind of pathetic kid who feels like he has no friends, feels like his life is cursed. And I think everyone can identify with that in one way or another. And then there's the fact that here he is, a kid who isn't a hero, but he lifts himself up and becomes one. I think readers can imagine themselves rising with Stanley. What was the hardest part of writing Holes? People often ask me how I managed to tie everything together at the end, but that wasn't the hard part. I knew how everything was going to fit together. The hard part was laying out the strands throughout the story, telling the story of Kate Barlow and of Elya Yelnats and Elya's son, without it getting in the way of Stanley's story. The other problem I had occurred when Stanley was digging his hole for the first time. I wanted the reader to feel what a long, miserable experience this is, digging those 5' by 5' holes. But how many times can you say, "He dug his shovel back into the dirt and lifted out another shovelful?" My solution was to interweave two stories, bringing more variety to the tale. Stanley's anxious first days at Camp Green Lake are set off against the story of his ancestor, Elya Yelnats, whose broken promise to a gypsy results indirectly in young Stanley's bad luck. 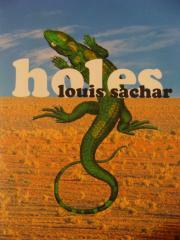 Holes is sweet and charming, but it is also darker and scarier than your other books. The warden, for example, mixes rattlesnake venom in her fingernail polish and threatens to scratch Stanley. Was it your intention to write a frightening tale? My daughter, Sherre, who was in fourth grade when Holes came out, surprised me when she told me that the warden was scary. I had never really thought of the warden as scary or that the scene as especially disturbing. Rattlesnake venom, well, it's almost cartoonish. It's like a situation from that campy old TV show, Batman. It was never my intention to write a grim story, and I don't think it is. For instance, I came up with the idea of the boys digging holes because I liked the irony, not because it was harsh. While they were ostensibly digging to build character, the camp warden actually had hidden and dishonorable reasons for demanding this chore. I wanted Holes to be fun and adventurous. How did you get the idea of rattlesnake venom in the warden's fingernail polish? It's hard to remember where different ideas come from, but I think it first started when I originally thought the warden was going to be the granddaughter of Kissing Kate Barlow. And Kissing Kate always killed the men she kissed. At the time, I may have even considered that her lipstick might be poisoned. So, I wanted to do something along the same lines. Instead of poison lipstick, the warden had poison nail polish. But then I ended up liking Kissing Kate Barlow, and liking her character. So, instead I made the warden the granddaughter of Trout Walker. How do you decide what is too scary for a child or how far you can go? Aside from the rattlesnake venom, there were other scenes in the book where I really did struggle with this issue. There was a scene where Kate Barlow, a notorious outlaw, is being tortured by these two people who have captured her to find out where she buried the treasure. Most of the time, my judgments are based on instinct and experience. I don't, for instance, experiment with kids to find out if I've gone too far. The book is very funny, but in an offbeat way. Yes. Sometimes when I start reading, people aren't quite sure if this is a humorous book or not, and they're not sure whether to laugh at first, and then gradually, people start laughing. Will you write a sequel to Holes? I don't expect to. I feel like the story is completely finished. I don't really have more to add to it.